Yep, another reason to hate us Californians. While the rest of the country is blanketed in snow, we’re out in the woods hunting for shrooms – golden chanterelles, hedgehog mushrooms, blewits, candy caps, and my all-time favorite, the black trumpet. 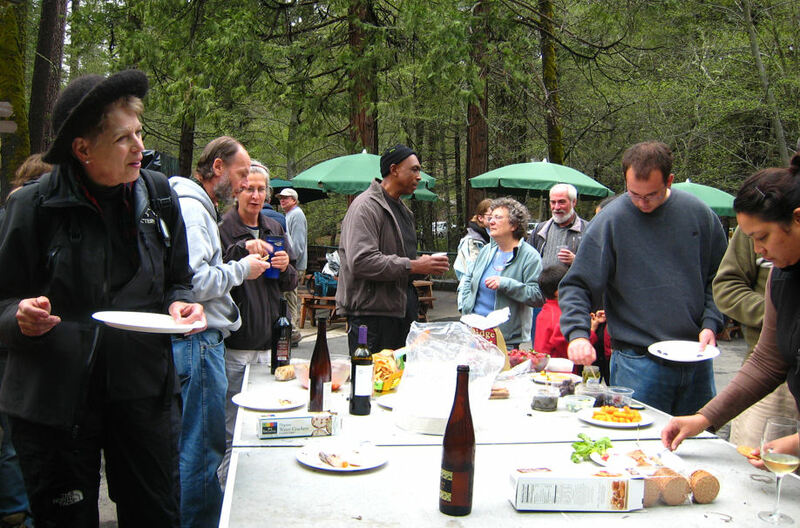 I joined the Mycological Society of San Francisco’s annual foray/camp in the Mendocino Woodlands last November. I must’ve gained 5 lbs in two days. If mushroomers didn’t get off their rears foraging fungi, we’d all have to be on crash diets during the dry season! I also spent a few hours trying to identify unknown mushrooms with J.R. Blair, a Biology lecturer at SFSU who introduced me to keying techniques a couple of years ago. But I have to confess that my belly has the upper hand which pretty much narrows the variety of mushrooms my brain pays the most attention to out in the field. Pizza heavily laden with bellybutton mushrooms, pepperoni and bell peppers! 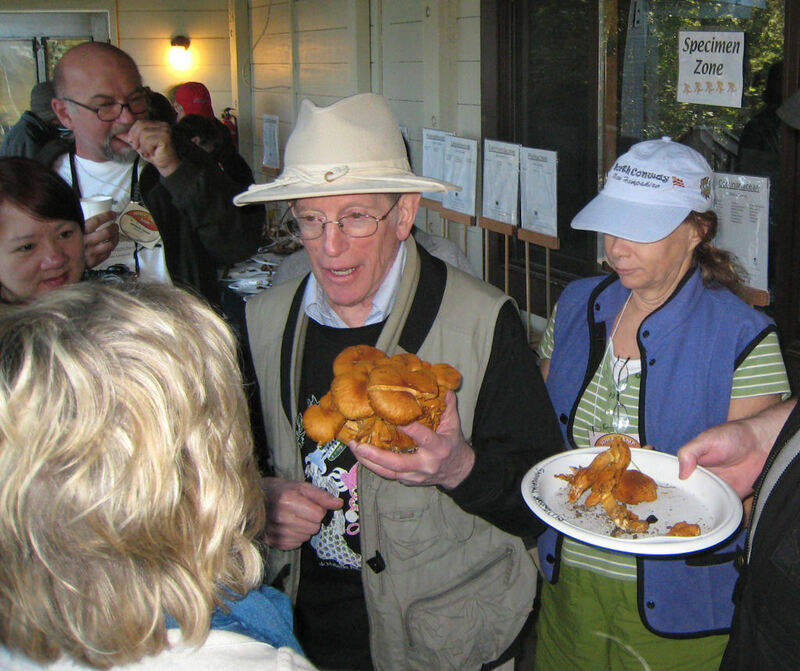 This January, the Bay Area Mycological Society’s All California Club Foray was in full swing at the Albion Field Station, also near Mendocino. Yes, we pigged out there, too, thanks to the superb catering from Debra Dawson, owner of Good Thyme Herb Company & Catering. But the ‘mycogeeks’ were also busy ID’ing those LBMs (little brown mushrooms) as well as gorgeous waxy caps and slimies like the parrot mushroom below. 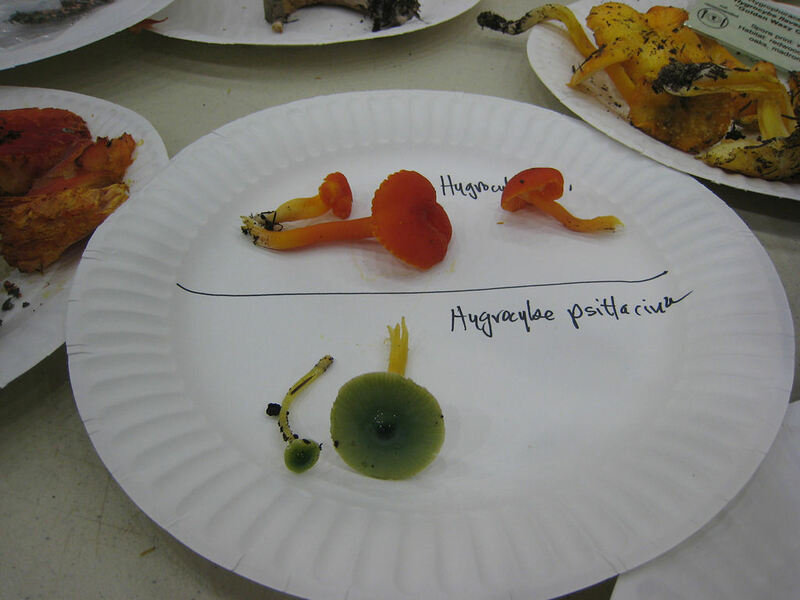 The Sonoma Mycological Society also held their camp in January, but at the CYO Camp near Occidental. The venue is ideal for courses in mushroom dyeing, making your own oyster mushroom kit, drawing, identification, and listening in on various topics given by experts from the fungal world. Gary Lincoff (shown below), author of several mushroom books, including The Audubon Field Guide to North American Mushrooms, is a popular guest from the East Coast, and whom you can always count on to add a few humorous anecdotes in his mushroom lectures. 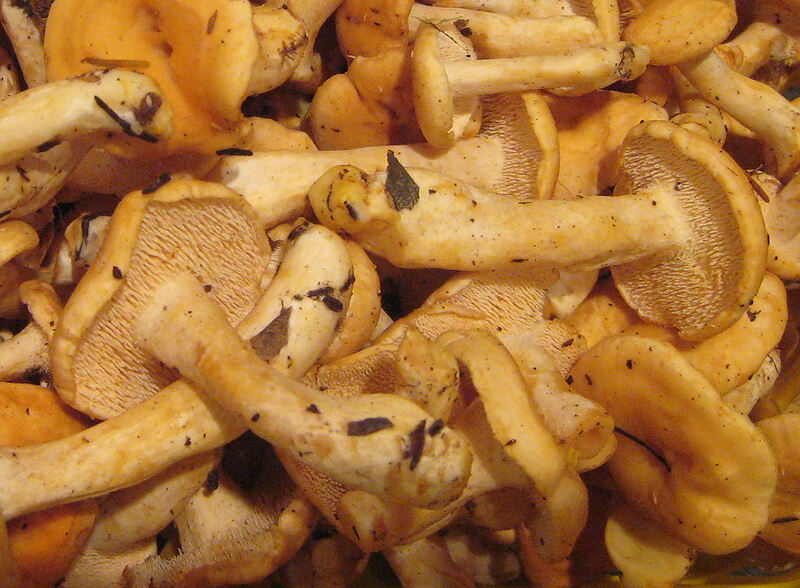 But the best part of mushrooming isn’t about the mushrooms as much as it is about the people who love mushrooms and share their love for good food prepared with wild mushrooms. Yes, the thrill of discovering your first morel in a quiet spring forest is exhilarating. But coyly giving the general whereabouts of that mother lode of black trumpets while sharing some of the loot over a bottle of wine is so much more fun.